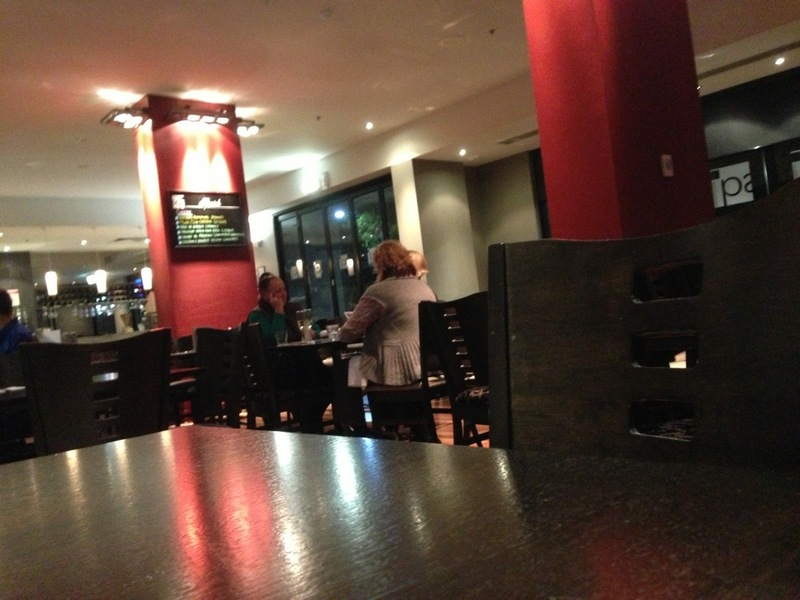 The third and final episode of my visit to Hindmarsh Square. Chinese waitress reads out very long list of specials from her notepad. I can’t understand any if it, but I don’t order specials anyway. I stick to the tried and tested menu items. They’re far more likely to be good than whatever the chef thought of this morning. 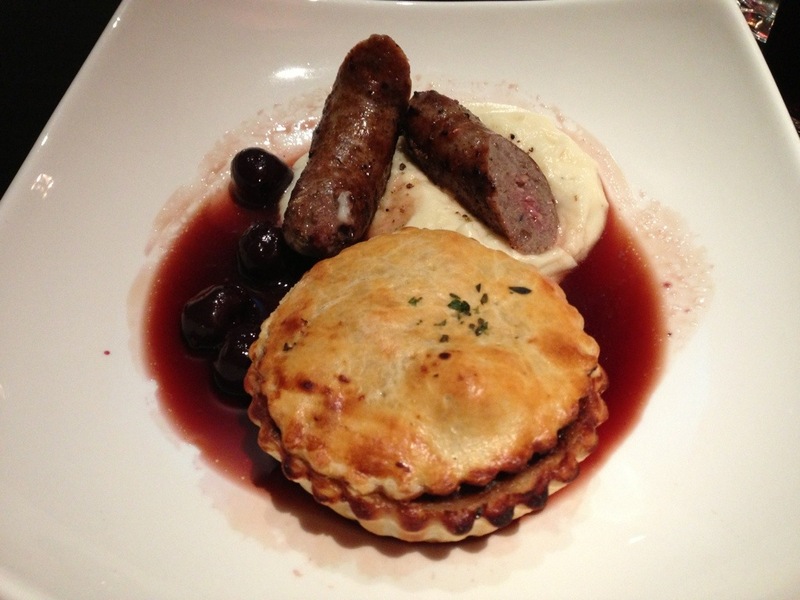 Hahndorf venison pie and Hahndorf venison sausage on parsnip purée with a vincotta. Hmm. Vincotta? Sounds like a panna cotta made out of wine. Will see. The sausages are slightly gristly, but that’s okay. They have a grilled taste and appearance, but they’re nothing too special. The mash is very fine, and has a strong buttery taste. The pie isn’t as good. Its contents are overwhelmingly just meat. There’s no strong flavour. It’s far less interesting than the sausage. The small amount of unknown filler has just adopted the taste of the meat around it. The only real taste this pie has is where it has touched the red wine in the bottom of the plate, and picked up a winy taste. The strange cooked cherries here have minimal taste, and don’t add anything when eaten with other components of the dish. If I were driving through Hahndorf, and I stopped in at a deli, to buy a pie, this would’ve been passable. 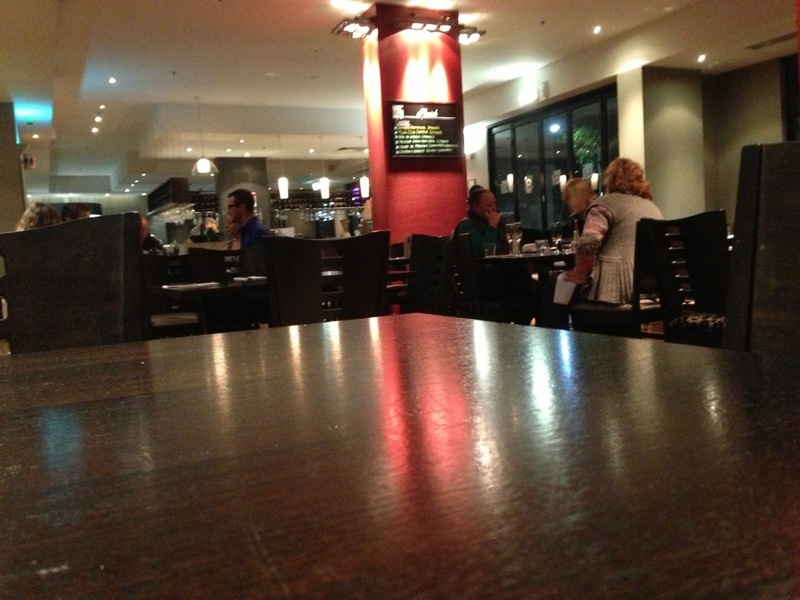 But as fine dining, it’s really nowhere near the mark. I really wanted the Coconut Panna Cotta too. 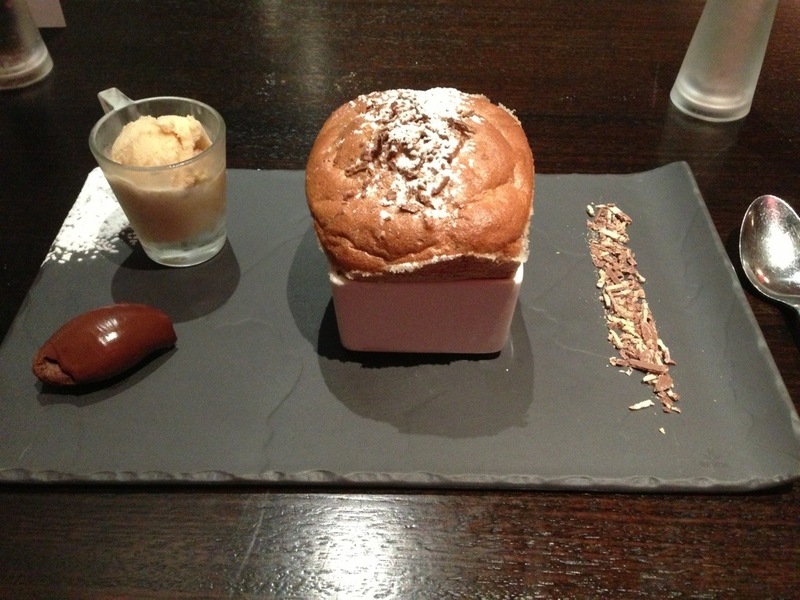 But I can’t resist a Kit Kat Soufflé. Panna cotta is very common – possibly the most common dessert. Soufflé is very rare. 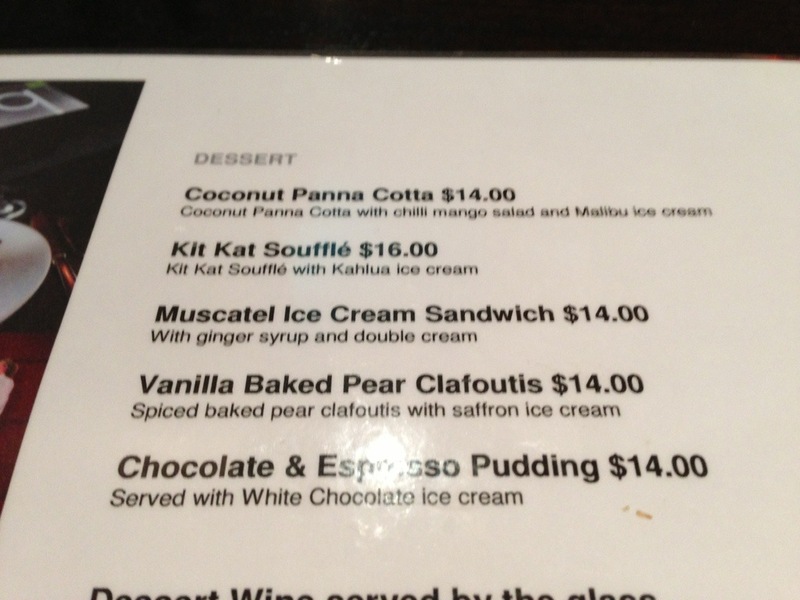 Also, panna cotta doesn’t really go with ice cream. 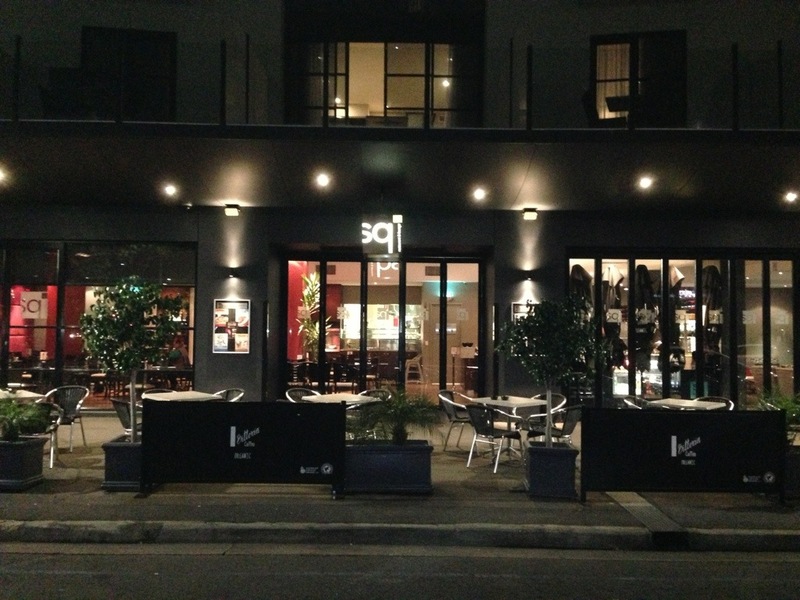 The soufflé has a light leathery shell, and on the inside is frothy and wet. Not ideal composition for a soufflé, but it’s pleasant nonetheless. It lacks a strong flavour, however. The Kahlua ice cream is very strong, but is just regular ice cream with Kahlua. It’s far stronger than the mild soufflé, and overpowers it easily, so I eat it by itself, and with the line of orphaned Kit Kat chips. The chocolate “poo” is next. It’s a bit like a big scoop of Nutella, but more chocolatey. It has a much stronger cocoa taste and slight bitterness. I have no idea what it’s supposed to go with, so I also eat it by itself. The components of this dessert were all reasonable, but had no connection to each other. I can’t even begin to comprehend why the corner of my slate is covered in icing sugar.